There are abundant places to go boating in northeast VT. Major lakes and rivers are the primary choices. The size of your boat or watercraft may dictate which waterways to consider. Often, out-of-the-way, smaller waters are less crowded and can provide a slightly different boating experience. Use these boating resources to locate nearby boating equipment and accessories to enhance your time on the water and keep the boat well maintained. Whether it's a family adventure or a fishing trip, boating in Vermont can be fun for all. In the listings below find resources for boating accessories, gear and supplies. Resources are listed within proximity of cities and attractions. Cities listed include Barre, Lyndonville, Montpelier, Morrisville and Newport. Contact them with your questions about safety equipment, marine electronics, water toys and accessories to enhance your boating experience. Locate boating gear, equipment and accessories at boat dealers, sporting good stores and RV centers throughout Vermont by location within or nearby cities in northern and eastern Vermont. 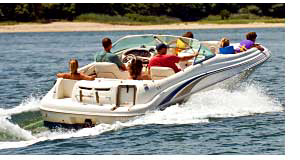 Northeast VT boating supplies, marine equipment and water sport gear. Click here to locate boats for sale in northeast Vermont. If your interest is fishing, click here for fishing boats for sale in Vermont. Local marinas like Barton Landing, Newport Marine Services and The Marina at East Side can often provide lake levels, launch ramp access and weather conditions for boating. Enjoy the northeast Vermont waterways in a boat fully equipped for convenience, safety, comfort and pleasure with boating supplies, accessories and equipment from these local boating outlets.